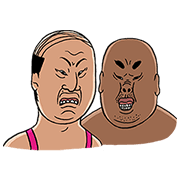 http://www.line-stickers.com/ – Goofy Twins, Jiro & Koo Line Sticker | Do they look old to you? Nah. Youʹll be surprised to see how young-hearted and innocent these rollicking twins really are. Friend the LINE Creators Market official account to get them! Available till March 31, 2015. Next post Joe from Next Door!